What’s the Big Idea for Change? Be Known for Something : Discover Your Church Communication Thread / Business Essentials / What’s the Big Idea for Change? We moved our PinPoint offices this past week and I find myself in a new office, with new challenges, new surroundings, new roads to the office, a new routine and new people that I run into. Everything seems different. I do like change. But I must admit the last 7 days has been stressful. Physically and mentally. So let me add: I like change, but perhaps a little at a time. One thing that this Big Change has done, is made me pause and think: what’s the big idea of what we do? Is it good to change things up? Should we do incremental change? Or a huge change? OK, it’s too late. We have so many changes, that I now realize, it’s easier to talk about the things that remained the same than talk about the new stuff. After all this, I really do think that challenging “Status Quo” is a good thing. I never want to do something “just because we’ve always done it”. What do you do regularly, that you should change immediately? What’s your big idea for doing what you’re doing? If you don’t know, then you can’t “sell” yourself. People are drawn to compelling reasons. Maybe this is the day you need to change. Not incrementally, but a drastic, kick-in-the-seat-of-the-pants change. 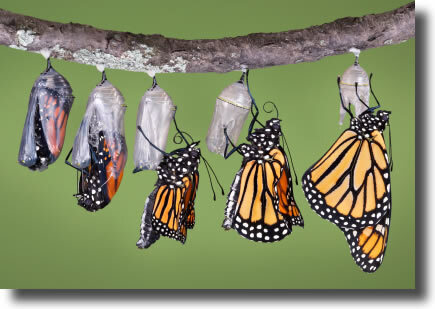 People sit up and listen (or at least watch) when you go through the metamorphosis!